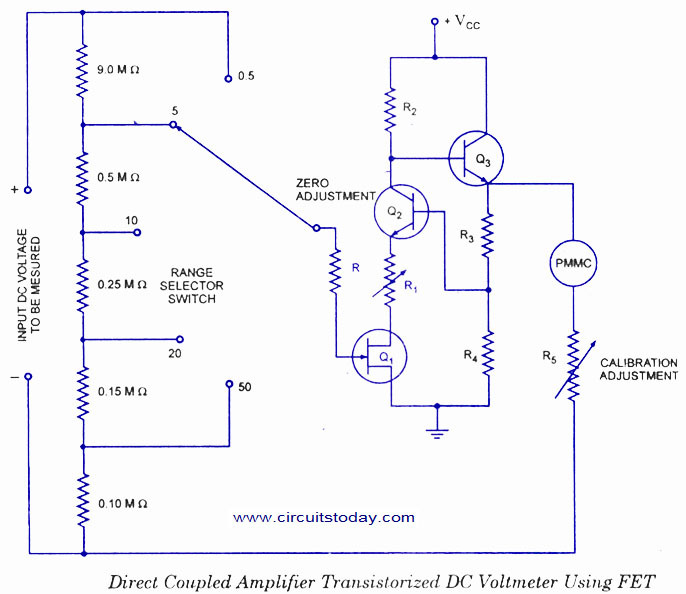 DC voltmeter mainly consists of a dc ampliÂ­fier apart from the attenuator, as shown in figure. DC voltmeters can further be divided into two categories. This type of voltmeter is very common because of its low cost. This instrument can be used only to measure voltages of the order of milli-volts owing to limited amplifier gain.Â The circuit diagram for a direct coupled amÂ­plifier dc voltmeter using cascaded transistors is shown in figure.Â An attenuator is used in input stage to select voltage range. A transistor is a current controlled device so resistance is inserted in series with the transistor Q1 to select the voltage range. It can be seen from figure that sensitivity of voltmeter is 200 kilo ohms/volt neglecting small resistance offered by transistor Q1. Other values of range selecting resistors are also so chosen that sensitivity remains the same for all ranges. So current drawn from the circuit is only 5micro Ampere. Two transistors in cascaded connections are used instead of using a single transistor for amplification in order to keep the sensitivity of the circuit high. Transistors Q1 and Q2 are taken complement to each other and are directly coupled to minimize the number of components in the circuit. They form a direct coupled amplifier.Â A variable resistance R is put in the circuit for zero adjustment of the PMMC. It controls the bucking current from the supply E to buck out the quiescent current.Â The draw-back of such a voltmeter is that it has to work under specified ambient temperature to get the required accuracy otherwise excessive drift problem occurs during operation. Another circuit diagram of a direct coupled amplifier dc voltmeter using FET in input stage is shown in figure.Â In this voltmeter, voltage to be measured is firstly attenuated with range selector switch to keep the input voltage of amplifier within its level. FET is used in the input stage of amplifier because of its high input impedance so that is does not load the circuit of which voltage is to be measured and it also keeps the sensitivity of voltmeter very high.Â As FET is a voltage controlled device so resistance network of attenuator is put in shunt in the circuit.Â Transistors Q2 and Q3 form the direct coupled dc amplifier whose output is finally supplied to PMMC meter. When transistors work within their dynamic region, the deflecÂ­tion of meter remains proportional to the applied input voltage. This voltmeter can be used for measurement of voltages of the order of milli-volts because of sufficient gain of ampliÂ­fier. Apart from the high input impedÂ­ance, this circuit has another advanÂ­tage that when inÂ­put voltage exceeds its limit, amplifier gets saturated which limits the current passing through the PMMC meter. So meter does not burn out. 2. Chopper Type DC VoltmeÂ­ter. 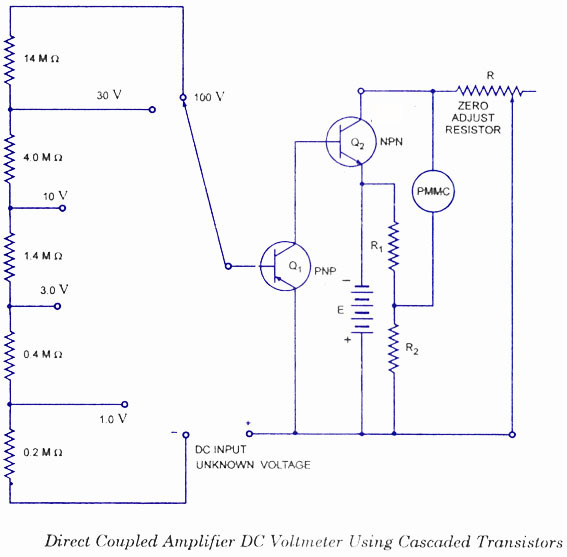 Chopper type dc amplifier is used in highly sensitive dc electronicÂ voltÂ­meters. Its block diagram is shown in figure. Firstly dc input voltage is converted into ac voltage by chopper modulator and then it is supplied to an ac amplifier,Â Â i Output of amÂ­plifier is then demodulated toÂ a dc voltage proportional to the original input voltage. Modulator chopper and demodulator chopper act in anti-synchronism.Chopper system may be either mechanical or electronic. Circuit diagram of an electronic chopper employing photo diodes is shown in figure.Â Photo diodes change its resistance under different illumination conditions, this property f photo diode is used in chopper amplifier. Its resistance changes from the order of few mega-ohms to few hundred ohms when it is illuminated by a light source in the dark place. Two neon lamps are used in this circuit, these are supplied by an oscillator for alterÂ­nate half cycles. Two photo diodes are used in input stage which acts as half-wave moduÂ­lators because of its alternate switching action by the neon lamps at the frequency of oscillator. Output of chopper modulator is a square wave voltage (proportional to the input signal) which is supplied to the ac amplifier through a capacitor. Amplified output is again passed through a capacitor and then fed to chopper demodulator. Capacitor is used to remove dc drift from the signal. Chopper demodulator gives a dc output voltage (proportional to the input voltage) which is passed through the low pass filter to remove any residual ac component. Now this dc output voltage is supplied to the PMMC meter for measurement of input voltage. In chopper amplifier dc voltmeter, input impedance is of the order of hundred mega-ohms and it has sensitivity of one micro-volt per scale division. we should show in vartual or visible ,while the doing reaction. I came across this column a while ago, and as the basic idea is excellent, I urged my students to read it. But not any more, simply because the published circuits – like the DC voltmeters with FET and BJT’s this time – are totally useless. Simplicity is fine, but why frustrate your readers by not publishing circuits that is useful AND simple at the same time?? (Yes, they exist, and are even plentyful!) May be building and CHECKING circuits before publishing would be very helpful to your readers? Good luck!